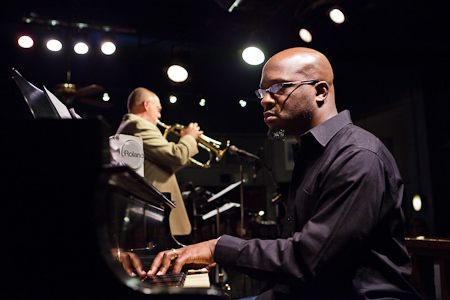 Thomas Marriott (trumpet) with pianist Orrin Evans at the 2011 Earshot Jazz Festival. Photo by Jim Levitt. Trumpeter Thomas Marriott unveils his first extended work for quartet with the Orrin Evans Trio on Wednesday, September 18 piece, entitled “Urban Folklore,” tells the stories of modern-day life that many of us share and live on a daily basis. Joining the seven-time Golden Ear Award-winning trumpeter are pianist and frequent collaborator Orrin Evans, Eric Revis (the longstanding bass player with the Branford Marsalis Quartet) and drummer Donald Edwards. The following day, Marriott and company will head into the studio to record. Opening for the quartet will be the Bull-Horns Sextet comprised mainly of students from Roosevelt High School. The band, led by trumpeters John Otten and Noah Halpern, features Luke Woodle on drums, pianist Gus Carnes, saxophonist Jory Tindal, and Will Langlie-Miletic on bass. Tickets for the show are $15.00 in advance, $20.00 at the door and are available online at strangertickets.com. The Royal Room is located at 5000 Rainier Avenue South in Seattle. Music starts at 8:00 PM and is an all-ages venue with full-bar and kitchen.